I alluded to our new table earlier this month, and my patterned vase was photographed on it, but I hadn’t taken any proper pictures until this morning. Brandon and I had a number of gift cards to west elm and Pottery Barn from Christmas, so we decided to combine them for a more spendy item. Not so fun fact: I knew that the gift cards were interchangeable because I actually worked at west elm briefly when they first opened their Chicagoland store. We looked around and finally settled on the parsons expandable dining table. Oh, and we were recognized by a girl shopping at the store! She saw Brandon first, and we later realized that it was probably because of the Christmas card! Tee hee. Notice the absence of my pretty white rug in the living room, and the rumpled replacement jute rug from the basement. Eh. Not bad, but not very good either. I love that three chairs can fit on each side now. The legs on our old table were inset from the edges and it was a little awkward with even two chairs on each side. Now if we really needed to squish, we can fit 10 people at the table when the leaf is in! I realized when I was taking photos that I had forgotten to follow up on the Tao console table I was considering from Room and Board. In fact, it’s been so long that Room and Board has since discontinued it. I did end up purchasing it for the dining room though! I hung my Amy Ruppel painting above it, and there’s a magazine butler for sorting mail (and keeping it neat). Now we get to the truth, which is that I think the dining room is a bit boring. Blah. Ho hum. It’s nice, but I’m not happy with just nice. You all probably know that I’ve wanted wallpaper from day one, and I’ve also been waffling and indecisive since day one. I think something darker would might look better. I want a little drama in the dining room, and I’m afraid that vintage floral may just give off ‘crazy’. I really should just make a decision already. Or slap some paint on the walls. Something. 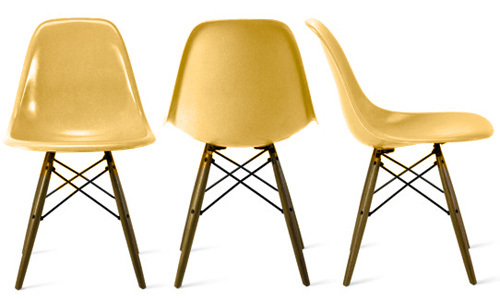 They’re Eames chairs without the official “Eames” name. They’re made by Modernica on the original presses though, and with the original fiberglass construction, so in my mind they’re more authentic than the polypropylene Herman Miller licensed chairs. They’re available at Velocity Art & Design in 16 yummy colors. I’m partial to mustard. I’m debating whether I should try to paint the chairs we have now. I don’t really mind the shape of them, I just don’t like the light wood in our house. I LOVE that wallpaper! I think it really makes the dining room something special. Not that it wasn’t before. Your house is beautiful! You know, I HATE wallpaper, HATE floral, and HATE pink. But that pink, floral wallpaper NEEDS to be in that room! I LOVE it! Well, for starters your new table is really nice! Painting/staining the chairs to better match the table/dresser/rails is a good idea. For the walls I’d prefer paint to wallpaper possibly with funky wall stickers. http://www.domestic.fr/index.php?serie=6 is great for some inspiration… and since you have a very good eye for colour, a more dramatic window treatment wouldn’t hurt either – crazy blinds like those featured in http://www.55max.com/product/index.asp?0,0,0,47,6 maybe ?? Btw your blog is GREAT!! I saw the grain of the table in the vase post but at the time I assumed I had been sitting at the computer for too long and going a bit nutty. I’m happy to know that I wasnt in fact nutty and you now have a gorgeous new table. I think its the floor that i dont like with the wall paper. I think you’re right, it needs to have some richer tones. 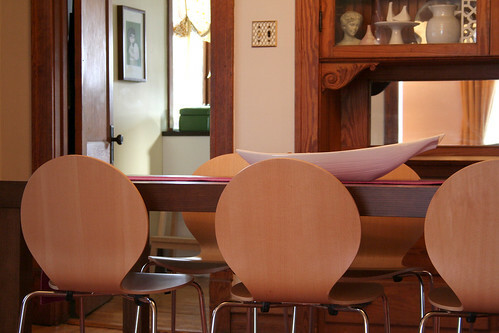 I’ve been lusting after the molded chair with arms for awhile now, rocker style. The pink and the mustard make me weak in the knees… hey, the mustard matches the fabric i picked out for the curtains in our living room. mmm… When I tell Henry, I’m going to blame it all on you! I love that table. It’s just what I want for our dining room. Gorgeous. I know you want drama, but I like it when each rooms flows into each other. Not all the same color, mind you. That I don’t care for. But it’s nice when all the tones are the same and you get a shot of three rooms at once and they are all harmonious. If you use really dramatic wallpaper in rich colors in the dining room, won’t it compete with the softer colors you have in the adjoining rooms? They’re pretty in their own right, and it’d be a shame if the dining room stole the show. Nice work! Lots of different elements that work well together. Compliments! I’ve noticed this several times, but what do you use to hang your pictures? Are they all hanging from the molding? 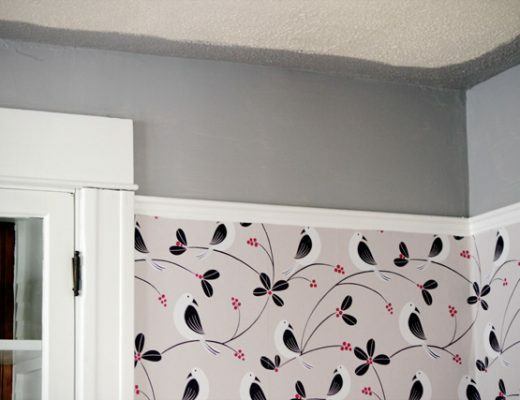 If you want drama *and* that wallpaper, have you thought about papering the top half of the wall, install a chair rail, and either paper the lower wall with a darker color/bigger pattern or do some sort of more dramatic paneling? I love your site and am so glad I discovered it! I was wondering where you found the dining room rug. I love the Chinoiserie-esque pattern..I can’t believe I just said that! I’m not crazy about the wallpaper. It’s not as awesome as the rest of the room. To me. You’re right, darker might be better. Or – I like the idea of a chair rail too. i love your dining room and i love that wall paper- but not together. simpler, graphic wall paper in a dark red or blue with white would be fresh and happy or even a bright paint for the walls. 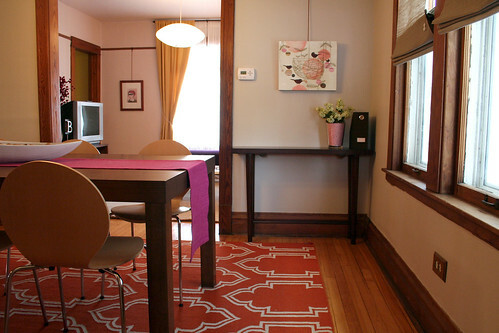 maybe use the pink flowers in a smaller room. I don’t like the wallpaper and rug combo. 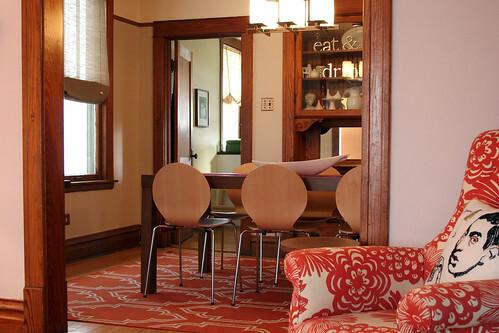 Why not move the red rug into the living room and get something darker for the dining room? And paint those chairs a dramatic constrasting colour. Have you thought of adding chair rail and doing the bottom half with wallpaper and the top with a corresponding paint color? You have great style – love the paper for a bedroom – not for the dining room. I think it may come off “looking like it was there when you moved in”- For Drama a chic fresh coat of paint in a great color, chocolate, chartreuse, violet or an amber! 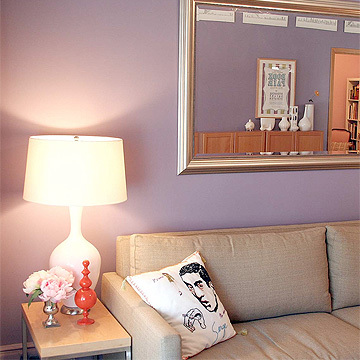 Keep in mind, that once you do this, then the living room may shout out for attention and color! 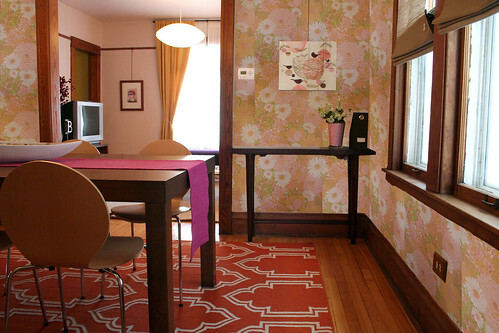 If you do the wallpaper – move the rug to the living room. So fun to dish out advice! Trust your inner designer, you have to live with it! I love your table – big enough for a crowd, that is great! The chairs are lovely, too. In fact, everything is beautiful! In my mind, wallpaper and rug don´t match. Per se, both are lovely. And I think the chairs in mustard would look great in this room! I would have thought that I’d hate that wallpaper as it looks like something my grandmother might have on her walls, but I actually really like it with your modern furniture. It looks really funky. I agree with some of the other posts, though – it doesn’t work with the rug. I would paint the chairs black and get a really dark rug, maybe black as well. But that’s just me, I like to use black as contrast. Why don’t you just go for it and try it out? If you don’t like it, you can always change it. Ok, it’s a bit of work, but the times I’ve been in doubt about a decorating project of mine, I’ve usually just done it, and a lot of times it has turned out to be the thing I like the most about my appartment. I have to go with the majority opinion on the wallpaper. :S I should include the caveat that I’m not a fan of wallpaper in general, so take my opinion lightly. If you decide to go darker in the dining room, the rug will look awesome, especially if you paint the chairs a darker color, or use a black lacquer. As always, I love the picture rail. I think the wallpaper is borderline grandma in a not good way :) I agree with the folks who have said go for a more graphic patterned wallpaper! Other than that, I think you should try painting the dining room chairs… the yellow would be really nice I think! oooooh, I am so jealous, that’s exactly the table I have on my wish list for our diningroom/my studio! I’ve been having internet connection problems over here… I couldn’t login and comment until now. I think I’ve decided to not use the vintage wallpaper in the dining room. It’s not quite right, and I think it would always bother me and I’d wish I had gone with something else. The rug does not have to stay. I don’t think I’d move it into the living room because it’s a bit much with my orange patterned chair, but maybe it would look good in the bedroom. I don’t know about the chair rail / paneling idea. Wouldn’t it make the room seem chopped up? I’m planning on painting the area above the picture rail and the ceiling (once I figure out what paint or wallpaper to use for the main walls), so I think that I could bring in additional color that way. Oooh, Romo has two new wallpapers that I’m really liking right now: This and this. tiffany blue paint- pink sky ceiling! I love the contrast of the dark table and the light chairs. 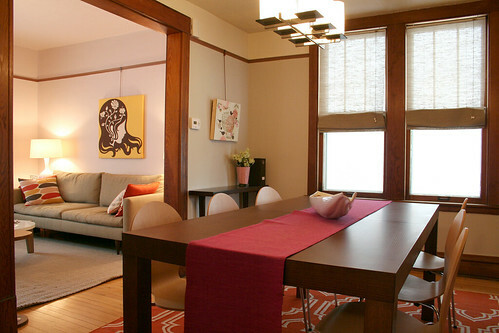 Of course, that’s very similar to my dining room, so I may be a bit biased. 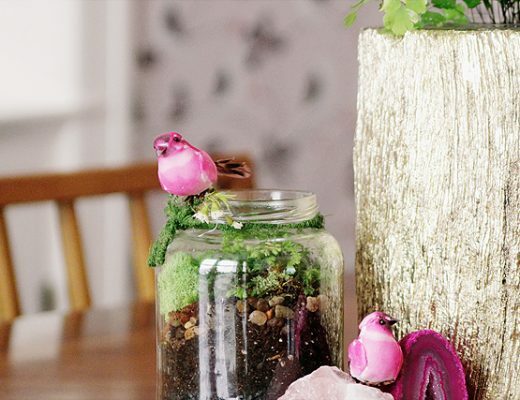 I just found your blog, and I LOVE the photos of your home– it’s beautiful. Who is the artist of the piece in your living room, over your couch? I really like it. The table is nice and sturdy! Chelsea, the art over the couch is actually a quilt over stretcher bars. It’s from Dream of Stars, but it looks like she’s closed up shop. I am loving your rug….orange? Where did you find it? It was from west elm. They don’t have the same one anymore, but they do have this one: taksim tile rug. I love the parsons table. My wife and I have been considering one, but we didn’t know they could be expandable. Brilliant! One thing I’ve been meaning to ask since the first time I saw the pictures of your beautiful home, where did you find the chandelier in the dining room? It’s fantastic! That chevon paper is awesome! Love your blog. Great pictures of your home much inspiration. Your anthro chair in the living room is my favorite. Just came across your blog…beautiful blog, beautiful dining room! I just put up some really graphic wallpaper in my dining room so I know how daunting the task can be. Your rug looks great in that room so I’d do a wallpaper with similar colouring, maybe more white than orange, and in a smaller print, to balance out the room. Great job so far! Sean, the dining room light is also from west elm: metal and wood chandelier. Please, oh please. Do tell me with what you use to hang your paintings from the picture rails. My landlords won’t allow holes in the walls (no use anyway – they’d likely crumble) but I haven’t found a material that I like to hang things with. This is only loosely related to this specific post – but can I ask what you use to get such awesome photos of your place? The point-and-shoot Canon my wife and I have works well enough for our blog, but I’m always jealous of how professional your shots look. What kind of camera? And other tricks you’d be willing to divulge? Thanks for the comment love on our site, Nicole. My wife and I totally love all your stuff so means a lot! * I almost always use a tripod. * I avoid using the flash. * I take a zillion photos from a few different angles, figuring that at least one or two will be good. * I take photos from a low height (usually around 3′ or so). * I try to plan my photos around the time of day that the daylight comes in best. * Photoshop is my friend! Megan, I order my picture rail hooks from Rejuvenation. loose the wallpaper, paint the chairs. Great design ! I have to say, that these pics are truly amazing. That you can capture the feel and lighting, and compose them is awesome. Are you able to keep you place looking this neat and clean at all times? I love design, and the problem I have is keeping it up and keeping it clean. We love Pottery Barn, and I haven’t visited a West Elm yet…which do you prefer? Where did you get your sense of design and style? any resources I can check out?